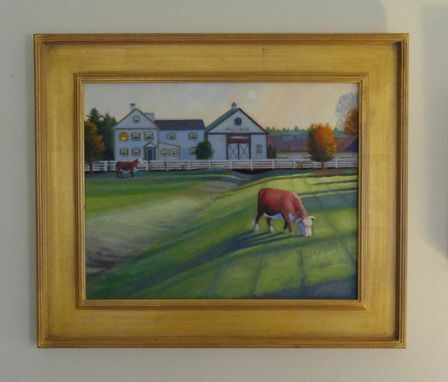 This commissioned painting was recently completed for a gentleman who lived and worked on Hill Crest Farm as a young boy. The painting has several nostalgic touches that were incorporated based on the information the client shared with me during our initial consultation. For instance, I chose a morning scene with a light on in one of the rooms. This is because he fondly remembers getting up early to attend to the herd of Hereford cattle. 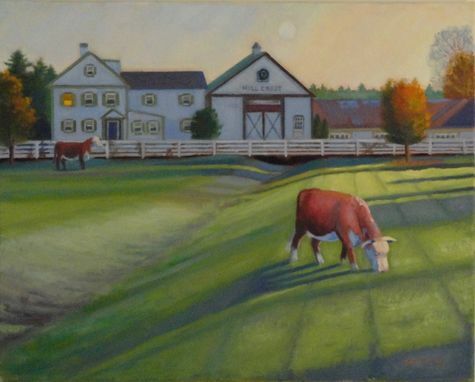 The two cattle in the field were also added to the painting in order to stage a historical scene. As the finishing touch, I added Hill Crest lettering above the barn doors.